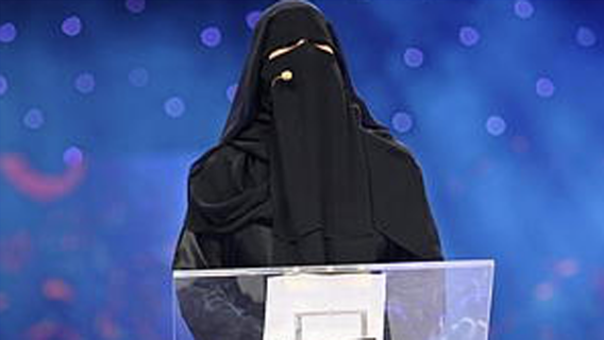 A burqa-clad contestant on the Arabic version of "American Idol" landed in the finals after bravely blasting hard-line Muslim clerics on live television, sparking outrage among religious conservatives in the Middle East. Unlike the wildly popular Fox show, contestants in the Middle Eastern version recite traditional and original poetry rather than sing. While most regale the audience with odes to the beauty of Bedouin life and glory of their rulers, Hissa Hilal stunned audiences last week by attacking Muslim religious leaders as "vicious in voice, barbaric, angry and blind," and guilty of "preying like a wolf" on people seeking peace. She specifically blasted fatwas -- declarations by imams that often incite violence -- as a side of the extremism that is "creeping into our society." "I have seen the evil in the eyes of fatwas, at a time when the permitted is being twisted into the forbidden," Hilal recited, speaking with only a hint of her eyes visible through her black veil. Naturally, her verse has inspired numerous death threats on Islamic militant Web sites. But her brave words clearly tapped a nerve, as she was wildly cheered by the audience and voted into the competition's final round. "My poetry has always been provocative," said Hilal, a housewife and mother of four from Saudi Arabia. "It's a way to express myself and give voice to Arab women, silenced by those who have hijacked our culture and our religion." Her poem was specifically seen as a direct assault on a prominent Saudi cleric who issued a fatwa against those who call for the mingling of men and women. More broadly, Hilal was also seen as attacking all the hard-line religious leaders who have widespread influence throughout the Middle East. "Killing a human being is so easy for them, it is always an option," she said. Hilal said she is concerned by the threats, but "not enough to send me into hiding." She worries more whether her newfound fame might turn her life upside-down -- facing a fate like that of "Britain's Got Talent" songbird Susan Boyle, who melted down under the spotlight. "I worry how I will be perceived after the show is over, when judgment is passed and people begin to talk about my performance and ideas," she said. "I worry the lights of fame will affect my simple and quiet existence." Poetry is hugely popular in Middle Eastern countries, with prominent poets rising to rock-star levels of fame. On the show, which is called "The Million's Poet" and is broadcast from Abu Dhabi across the entire region, contestants are rated by their voice, style of recitation and the subject matter. The judges gave Hilal top marks for her impassioned performance and tackling a controversial topic. Their opinions, coupled with voting from people in the audience and through text messages by viewers, landed her in the final round. "Hissa Hilal is a courageous poet," said judge Sultan al-Amimi, who manages Abu Dhabi's Poetry Academy. "She expressed her opinion against the kind of fatwas that affect people's lives and raised an alarm against these ad hoc fatwas coming from certain scholars who are inciting extremism." What a brave lady! May the Lord protect her!